At C&F Bank, we are committed to protecting our customers’ financial information. In addition to taking every precaution against fraud, we want to equip you with reliable, convenient ways to keep your accounts secure. By logging in with your unique fingerprint, you avoid the risk of using a password that could be stolen. Always know what’s happening with your account in real time. Customize alerts according to your needs, choosing how and when the bank contacts you. See a suspicious transaction? You have the power to turn your debit card off immediately. Paper bank statements are often plundered solely for their valuable data. Eliminate that risk by signing up for electronic delivery, choosing when you want to receive and view your statements. Pay your bills conveniently all in one place—without sacrificing security. In a rush or in a crowded environment? Access balances quickly and safely using the instant balance function. Get Started with C&F Mobile Banking. Download the app now! Or, visit your local branch and ask us how we can help set up your Mobile Banking account. Always inspect and don’t immediately open email attachments or click on links in unsolicited or suspicious-looking emails. Even if you know the sender or are waiting on a specific email, don’t immediately click on links or attachments. Cybercriminals have made it their job to construct fake emails that look legitimate. Some fake emails are so good; it can be easy to click on malware if you are rushing or don’t focus on taking the time to think before you click. To learn more about fraudulent emails, click here. We have seen it all over the news; incidents of password reuse are on the rise. Hackers have obtained usernames and passwords leaked from websites such as LinkedIn, Facebook, Instagram and others. Even Mark Zuckerberg, Facebook’s CEO, was hacked. It is for this reason that passwords are often considered the weakest link in the cyber security ecosystem. Why should you use different passwords? How do we choose a strong password? What are the common password pitfalls? To learn more about how to have a strong password, click here. Identity theft is the use of another person’s identity for economic gain. 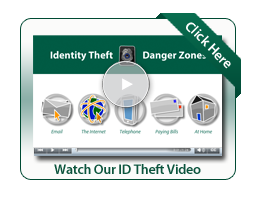 Anyone can be a victim of identity theft and people often put themselves at risk unknowingly. Identity thieves can steal assets in multiple ways. Two common methods involve identity thieves using existing accounts to make purchases, pay for services, or withdraw money and identity thieves opening new accounts/service agreements with stolen information. Below are helpful prevention methods. Only use secure bank connections to review your account or authorize transactions. Only use secure websites for making online purchases. Set up security questions and answers for access to accounts. Never save credit/debit card information online. Shred all documents that obtain your personal information. Destroy labels on prescription drugs before discarding. Be guarded when entering PIN numbers. Keep a list of credit card, account numbers, and other personal information in a secure place.